Live the GAME!!! We know you heard about all the crazy fun we had last year!!! We're hosting our SIXTH annual Monopoly Mania soon!!! Get your tickets before they're gone! Monopoly like you've never seen! It's HAPPENING March 1st at 6:00 p.m.!!!! The event comes complete with dinner & dessert, music, a fabulous silent auction, endless popcord, random prizes and SPECIAL CARD games with incredible prizes!!! We had a blast the last three years and it's going to be even more exciting this year.... you DO NOT want to miss!!! Tickets for players are only $35.00 per person (advanced purchase only)! Be one of the FIRST to purchase your tickets for this fun-filled night! We have made this year's event....FAMILY FRIENDLY....players must be at least 13 years old and accompanied by a parent. SPECIAL NOTE: We "suggest" that you purchase a "GET OUT OF JAIL" card for $5 in case you land on GO TO JAIL and do not receive the GET OUT OF JAIL FREE card during the game! We are prepared to "arrest" those in violation of not having the "card" and we have the return of our infamous JAIL complete with those wild and crazy "Officers", sworn to, and anxiously awaiting their opportunities to uphold their assigned duties and cart you off to the "pokie"!!!! Bankers at each table will assist you in tallying your monies and property value and at the end of the game to determine the "richest" person at your table who in turn will choose their prize in the Grand Prize Lottery!!!! Every "table winner" will receive a prize!!! Mr. Monopoly and Lady Luck will be on hand to assist with handing out gifts and keeping the "fun" going!!!! The LAND BARON SPONSOR cost is $250 per property (however that will include 2 complimentary tickets valued at $70, dinner, the benefits of special and continuous recognition of you and your business, a 3' x 4' replica of your property which will be displayed on the wall AND entry into a Land Baron ONLY drawing. Fandango City Palace - 3510 Wible Road!!! Admission for Players: $35- Payed in advanced to the Volunteer Center of Kern County. Purchase tickets from our office, over the phone, or contacting our office for other arrangements. You will receive your Monopoly Ticket(s) in the mail (if paying over the phone) or in person at the office. - (2) Monopoly Player tickets, valued at $70. - Replica of the sponsored property displayed with you/your business name. - Entry in the Land Baron ONLY drawing. - Your sponsored property displayed on the wall during the event for special continuous recognition! Sponsorship needs to be payed in advanced, directly to the Volunteer Center of Kern County. Purchase tickets from our office, over the phone, or upon delivery of your tickets and sponsored deed! Sponsor your property today while they last! 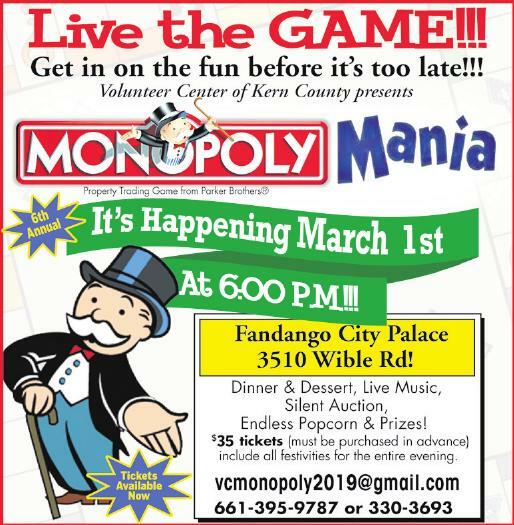 See MONOPOLY MANIA 2019 flyer on the home page!! !